There was a good article in the Chicago Tribune today about Rev. Timothy Keller, the pastor of Redeemer Presbyterian Church in Manhatten, entitled Spreading An Urban Gospel. An important lesson that Keller said he had tried to convey is that the hard sell rarely works in the city. Becoming a Christian in a place like New York, he said, is more often the product not of one decision but of many little decisions. His church's main goal, Keller said, is to teach pastors how to truly love the city, rather than fear its worldly influences. Unlike many evangelicals, Keller advocates an indirect approach to change. I urge you to listen to this six minute NPR clip about the education of African American boys. Rosa Smith, the president and CEO of the Schott Foundation for Public Education says, "One of the things I things I think that is problematic is that too many of the people who work with black male students cannot imagine them to greatness. It gets in the way that they think about our kids and it sets expectations." Wow! Campolo challenged pastors to take up their prophetic calling to be opinion shapers and not to avoid issues like poverty, education, war, government sponsored torture, and economic injustice, to risk more. Read more at the Leadership Journal blog. I finally got the opportunity to see the movie the The Second Chance starring Michael W. Smith and Jeff Obafemi-Carr. It's great! Early in the movie, Pastor Jake, the Black pastor of the Second Chance Community Church, gets an opportunity to speak a few minutes at Second Chance Sunday at the Rock, their sponsoring megachurch in the suburbs. He says that on his way a young girl in his neighborhood came up to his car window with what appeared to be a baby (probably plastic) in a blanket. He said he gave her a few dollars to get rid of her. He said he felt like they were doing that with their Second Chance Sunday. He told them if they weren't willing to come into his neighborhood and get involved, they could keep their damn money! A moving scene for me was one in which a mentally challenged man washes the feet of a young man who took a beating for another kid to get him out of a drug dealing gang. He asked for forgiveness for judging him. "I was more concerned about the fact that you said the word 'hell' than about how you were feeling, and I've never been beaten like that." It's a great movie with an important message to the church. The only problem was I went to the 5:45 show and I was the only one in the theater. I wanted to go out and hand out flyers or something! It's been awhile since I took the Myers-Briggs test so when I found this online test based on it, I was interested to see if my personality type might have changed... Nope, I'm still an INFP (intuitive, introverted, feeling and perceiving). I guess that makes me an idealist who is focused internally and relies alot on my intuition. Ya think?! OK, my people are intent on helping people and making the world a better place, serving humanity. We are on a continuous mission to find truth and meaning, and though somewhat reserved in expressing emotion we have a deep well of sincere care for people... oh, and we don't like conflict. We go to great lengths to avoid it. Annie Dillard (Pilgrim at Tinker Creek) Yea!! I love her!! So, which personality type are you? Any other INFP's out there? Malcolm Gladwell wrote an interesting article for The New Yorker about the problem of what to do with the chronically homeless. He tells the story of Murray Barr whom he estimated used more than a million dollars in medical services during his ten years on the street. It would have cost less to give him his own apartment and a full time caretaker. The Second Chance movie opens tomorrow. Click here for listings and here to view a "behind the scenes" video. 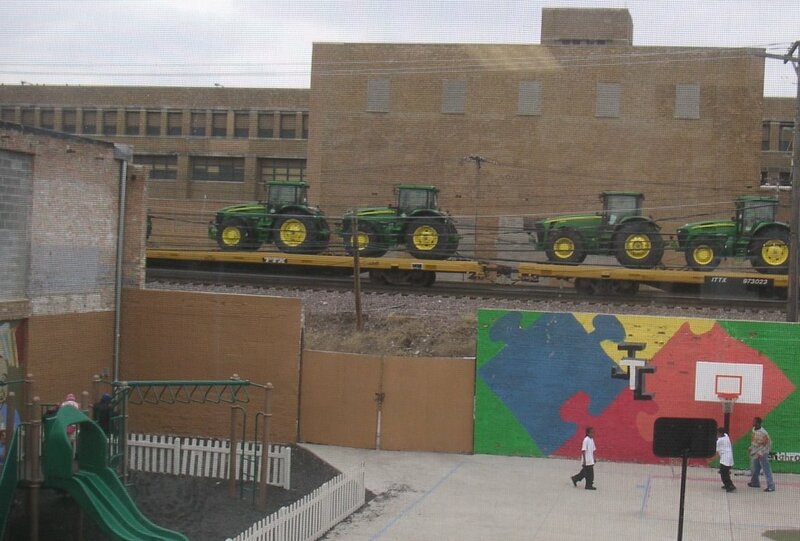 I love it when the metra tracks stream a train load of John Deere tractors past the Breakthrough Joshua Center. It is such a contrast that symbolizes my life... from a farm in Iowa to East Garfield Park. The kids playing basketball are part of our Youth and Family program and the school in the background is Westinghouse High School. My guess is that the tractors are from the John Deere plant in Moline headed for Ohio or somewhere like that. Isn't this a cool picture?! I have a tattered copy of an article by Dennis Hamm entitled "Rummaging for God" from the May 14, 1994 edition of America, the National Catholic Weekly. I have been carrying it around in my black bag for the last several years because it has been such a great reminder to me to pray the "prayer of examen". 2. Review the day in thanksgiving. 3. Review the feelings that surface in the replay of the day. 4. Choose one of those feelings (positive or negative) and pray from it. I was so happy to find the article online. Check it out! “The biggest disease today is not leprosy or tuberculosis, but rather the feeling of being unwanted, uncared for, and deserted by everybody. We can cure physical diseases with medicine, but the only cure for loneliness, despair, and hopelessness is love”. I was excited to learn that a chapel service at Asbury College was so filled with the power of the Spirit that it didn't end. Students and community members have been turning their lives over to Christ and many have been renewed by the power of the Spirit. They continued meeting in prayer and worship throughout the week. Wow! Thanks to "Westy" for this link to a Christian Science Monitor article entitled "Does Money Transform Schools?" The difference in annual spending between the wealthiest district and the poorest has grown to $19,361 per pupil, according to the most recent school-spending data and a Chicago Tribune analysis. 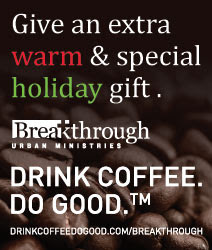 "GENTRIFICATION WITH JUSTICE - STARBUCKS, AFFORDABLE HOUSING AND CHRISTIAN COMMUNITY DEVELOPMENT"
Gentrification affects all of us is urban ministry, either now or in the very near future. In many of our communities it is stampeding us like a runaway herd of cattle. The Christian Community Development Association is sponsoring a working seminar with Bob Lupton on the challenges of gentrification. The symposium will be on Tuesday, 28 th February, 9 AM until 2 PM at Lawndale Community Church, 3827 W. Ogden, Chicago, IL. The seminar is free to CCDA members and lunch is provided. Non-CCDA members are invited and will be charged the cost of the lunch. Dr. Robert Lupton is Executive Director of FCS Urban Ministries; he has been engaged in Christian Community Development for more than three decades in his native Atlanta. Bob has lived in the inner-city neighborhoods, he has worked so diligently, faithfully and tirelessly to help redevelop communities to bring about diversity, both racial and economic. He has championed the cause of developing communities that would reflect the kingdom of God. 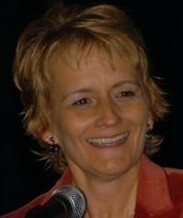 Bob is one of the co-founders of CCDA. Please contact Jimmy Gaither at the CCDA office to advise us that you will be attending the Bob Lupton seminar. Jimmy’s email is Jimmy@CCDA.org or you may call him at 773.762.0994. We need to know if you are attending so that we have lunch for all. The seminar is being co-sponsored by World Vision in Chicago, Extension Ministries at Willow Creek Community Church and Lawndale Community Church. I learned tonight at a Super Bowl party that Mike Holmgren and his wife Kathy are committed Christians connected with the Covenant Church and North Park University. Here is a link to last Sunday's Tribune article about them and a quote from it. Sunday at 5:25 p.m.--just after midnight in the Congo--as Mike Holmgren realizes his dream of taking a second NFL team to the Super Bowl, his wife will be fulfilling hers a world away in Africa. In 1970, Kathy Holmgren was a young nurse and recent graduate of North Park College (now University) in Chicago who shelved her goal of becoming a medical missionary to get married and start a family. Kathy loved the year of missionary work she spent in the former Belgian Congo healing the sick but loved even more the young man she'd met at a church camp in the Santa Cruz Mountains in California when both were 13. I noticed in the book section of the Tribune that Taylor Branch will be at the Harold Washington Library Monday night at 6:00 to discuss and sign his latest book in a trilogy of the life of Dr. Martin Luther King, At Canaan's Edge. I have a commitment at that time or I would be there. This book, like the first two, Parting the Waters and Pillar of Fire, is another long one more than 1,000 pages. I read Parting the Waters last year. Branch is amazingly detailed to the point of describing what King and Abernathy ate for dinner. If you want a detailed account of the civil rights movement, this is a must read. Thanks again Kim for this great link to Bono's speech. Isn't it so cool that God would choose a rock star to be his prophet?! 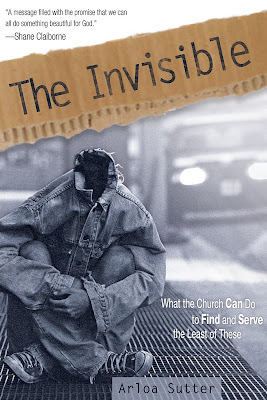 "Throughout the gospels, Jesus speaks more about serving the poor than he does about what it means to be born again. He talks more about our response to the poor than he does about prayer. Jesus' reference to the poor in Matthew 26:11 comes on the heels of his final sermon in Matthew 25. He finishes his discourse with the story of how the King separates the sheep (believers) from the goats (unbelievers); his criteria is how well they cared for him when he was poor and needy."